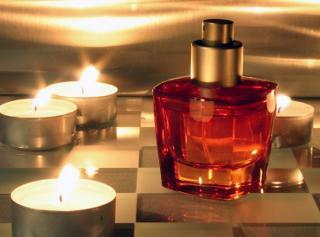 Perfume candle scents mimic popular fragrances that women and men often wear. While you can purchase ready-made candles created by the fragrance manufacturers, there are also many imitation scents available allowing you to make your own perfumed candles. Candles that carry the familiar scents of perfumes can be found in many stores that sell high-end candles, and you can also get them where you would buy perfume or cologne. Oftentimes these candles come as part of a gift set, along with a bottle of the perfume itself. The main thing to keep in mind when purchasing these specialty items with perfume candle scents is that the candle may not smell exactly like the perfume when burned. Fragrances that are worn on the skin can change slightly depending on the person wearing them, while the candle will be the pure scent. There can be slight but noticeable differences between them. If you want to try making a candle that smells like your favorite perfume, the easiest way to accomplish this is to find an imitation fragrance oil. These scents are man-made blends of synthetic fragrance, and you'll find a good variety of them at candle supply shops, both in person and online. Perfume candle scents come in both women's and men's fragrances, and are usually labeled with the name of the perfumer, followed by the word "type." In this case, "type" means that the scent was not blended or endorsed by the creator of the perfume, but is meant to smell just like the original. Most of the perfume scents available for candle making are based on popular and common fragrances. If you prefer more obscure or different perfume or colognes, you may have a difficult time finding the exact scent you're looking for. Candle Science - Candle science carries a good basic variety of candle scents, from sweet scents like blueberry cobbler and cinnamon buns to plumeria and baby powder. Sweet Cakes - It can take some digging, but at Sweet Cakes you'll find lots of different perfume fragrance oils for both women and men. There are copies of many of the popular Victoria's Secret scents, as well as classic and trendy perfumes and colognes. If you can't find the right perfume scent for candle making, you may be tempted to just pour in some of the real perfume or cologne along with the melted wax. This is a bad idea, and can cause many problems. Fire hazard - Perfumes and colognes are usually alcohol-based, and alcohol is extremely flammable. Any type of candle containing straight perfume is an instant fire hazard. Problems with wax - Fragrance oils blend well with melted wax and, if used in the correct proportions, will not affect how the candle wax sets. Perfumes can cause the wax to be brittle, chunky, and discolored. Scent burning off - Even if you can successfully make a candle containing real perfume instead of a fragrance oil, the scent itself will bur off very quickly because of the alcohol base. A scented oil burns much more slowly, giving the candle staying power. If you enjoy blending your own scents, you can try to create your own perfume imitation fragrance. Just find a detailed description of the scent itself, which will give you the notes of the fragrance, and play around with combinations of scented oils to try to match it. Whether you've purchased your perfumed candles or made them by hand, they can add a lovely scent to your home. Burn only one or two at a time to avoid an overwhelming amount of fragrance. These candles also make terrific gifts!